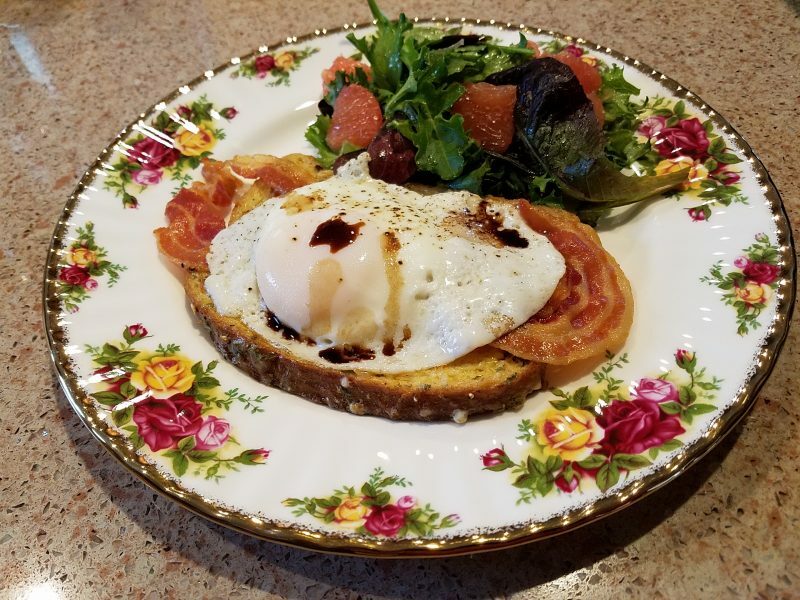 As those of you who follow our blog know, we alternate savory and sweet main dishes when serving our guests their four-course breakfasts at The Carriage House Inn Bed and Breakfast. This month’s recipe is a great, hearty dish that would make a fabulous Christmas morning treat, or even for a New Year’s Day brunch. This savory French Toast is a twist on bacon and eggs with a touch of a unique French Toast added. Put a baking sheet, lined with parchment paper, in the oven and preheat to 250°. Whisk 4 eggs, the milk, 1/4 cup cheese, the parsley, 1/2 teaspoon salt and a few grinds of pepper in a baking dish; set aside. Heat 1 tablespoon olive oil in a large nonstick skillet over medium heat. Add the pancetta and cook, flipping, until crisp, 4-5 minutes. Drain on paper towels, reserve the drippings in the skillet. Heat 1 tablespoon olive oil in another large nonstick skillet over medium heat. Add the bread to the egg mixture and let soak, turning once, about 1 minute. Add 4 of the bread slices to the skillet and sprinkle each with 1 tablespoon cheese. Cook until golden on the bottom, about 2 minutes. Flip again and cook until the cheese melts, about 1 more minute. Transfer to the baking sheet to keep warm and repeat with the remaining bread and cheese. Heat the skillet with the pancetta drippings over medium heat. Crack the remaining eggs into the skillet and cook until the whites are set, about 3 minutes. Divide the French toast among the plates and top with the fried eggs. Toss the arugula in a bowl with the remaining 1 tablespoon olive oil and a pinch each of salt and pepper. Add to the plates. Plate the pancetta. Drizzle eggs with the balsamic vinegar.